3 Bedroom Flat For Sale in Birmingham for Asking Price £425,000. 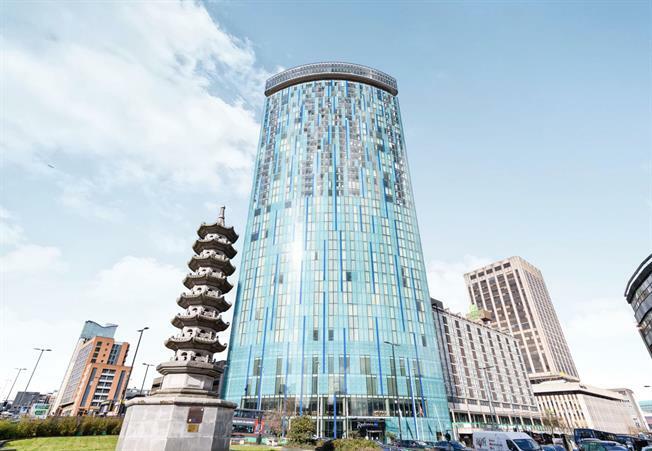 Aspirational City Centre living at its best is on offer at Birmingham's most iconic building Beetham Tower. Experience the City scape views from the properties sky garden at this 30th floor, three double bedroom apartment with the valuable addition of secure underground automatic self parking garage. The development benefits from a highly desirable 986 years remaining on the lease. The full length curved glass windows from the lounge afford panoramic views, the master bedroom has an en-suite as well as a walk in dressing area, two further double bedrooms and a newly fitted family bathroom with fitted digital TV and ceiling speakers. This luxury apartment is not to be missed, contact Dixons to arrange your viewing appointment. Solid core door with stainless steel handle, utility and storage cupboards, recessed directional down lighting, gloss laminate flooring. Sliding double glazed glass door leading to sky garden, double glazed floor to ceiling windows with patterned glass, warm air system with cooling cycle, gloss laminate flooring, recessed lighting, and spotlighting. Kashmire granite work surface, mirrored backed glass splashbacks, fitted bespoke wall and base units, stainless steel undermounted bowl sink with single lever tap, integrated electric multifunction oven with integrated electric hob and over hob extractor, integrated dishwasher, fridge and freezer. Storage cupboards, gloss laminate flooring and recessed lighting. Timber frame glass sliding door with fixed glazed screen leading to sky garden, opening lourve glas facade and low level lighting. Double bedroom with floor to ceiling double glazed windows, warm air heating system, gloss laminate flooring, recessed lighting, walk in dressing area and door leading to en-suite shower room. Low level WC, double enclosed shower cubicle, wash hand basin, extractor fan, shaving point, heated towel rail, tiled flooring and spotlights. Double bedroom with floor to ceiling double glazed window and rapid ventilation window, warm air heating system, gloss laminate flooring and recessed lighting. Double bedroom with floor to ceiling double glazed windows and rapid ventilation window, warm air heating system, gloss laminate flooring, recessed lighting and built-in storage cupboard with water tank. Low level WC, panelled bath with mixer tap, shower over bath with glass bath screen, wash hand basin with mixer tap, shaving point, heated towel rail, tiled flooring and spotlights. Fitted digital TV over bath with ceiling speakers.